The governor also warned that both of the state's medical schools might have to close and that several big hospitals may have to lay off staffers. 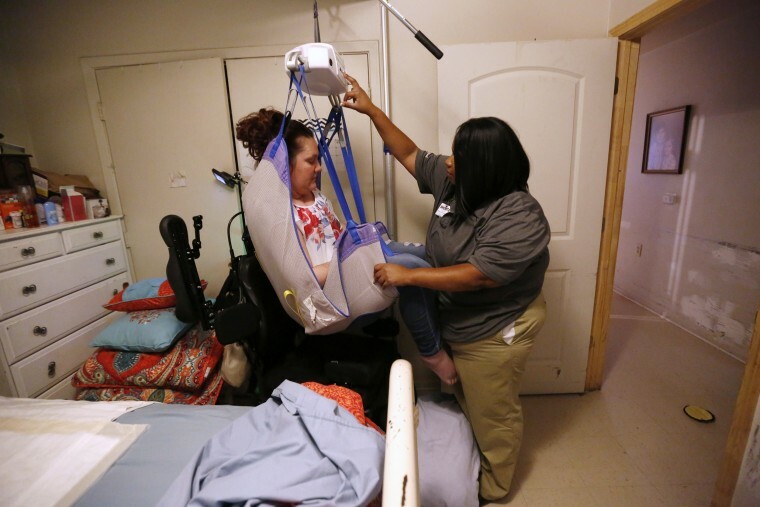 For Jamie Duplechine, a quadriplegic who has spent more than half of her 38 years in a wheelchair, it’s an endless source of amusement that three of the caregivers who watch her around the clock in her Louisiana apartment just happen to be named Shonda, Shamanda and Sherry. Karen Scallan is also on a first name basis with the caregivers who come to her suburban New Orleans home to help her take care of her 17-year-old son, who has Down syndrome — and free her up so she can work and take care of her 63-year-old husband, who suffers from diabetes and Alzheimer’s disease. So when the letter arrived this week warning them that they were at risk of losing their health care services starting on July 1 because of their state’s budget crisis, they reacted the same way — with dread. Scallan, 59, said having the extra help enables her to work from home as a private adviser to other individuals with disabilities who need help navigating the Medicaid system. The Louisiana Department of Health, on orders from Democratic Gov. John Bel Edwards, mailed 37,000 letters out to people Tuesday who rely on Medicaid health care programs that are considered “optional” under federal guidelines. The letters warned them they could lose their home health care aides and be forced out of their nursing homes starting July 1. Edwards on Thursday also warned that both of the state's medical schools might have to close and that several big hospitals may have to lay off staffers. The reason? The Republican-controlled state House of Representatives made deep cuts to the proposed budget to make up for a $650 million shortfall rather than continue a temporary tax which ends on June 30 — and had been buttressing the bottom line. The GOP was outraged by Edwards’ move. Henry’s broadside was followed by a strident statement from the state’s Senate Republican Delegation. But Edwards’ chief numbers guy insisted their only aim was to give the people who rely on the endangered services plenty of time to prepare for the worst. Sandee Winchell, executive director of the Louisiana Developmental Disability Council, said she was outraged lawmakers would even consider making cuts that would harm some of the state’s most vulnerable residents. Scallan said the letter arrived during a week in which she was knocked off her feet by a virus and during which her husband’s heath took a sudden turn for the worse. She said they’re going on a vacation courtesy of the Make-a-Wish Foundation in a few days and, given how frail her husband is, it’s likely to be their last as a family.